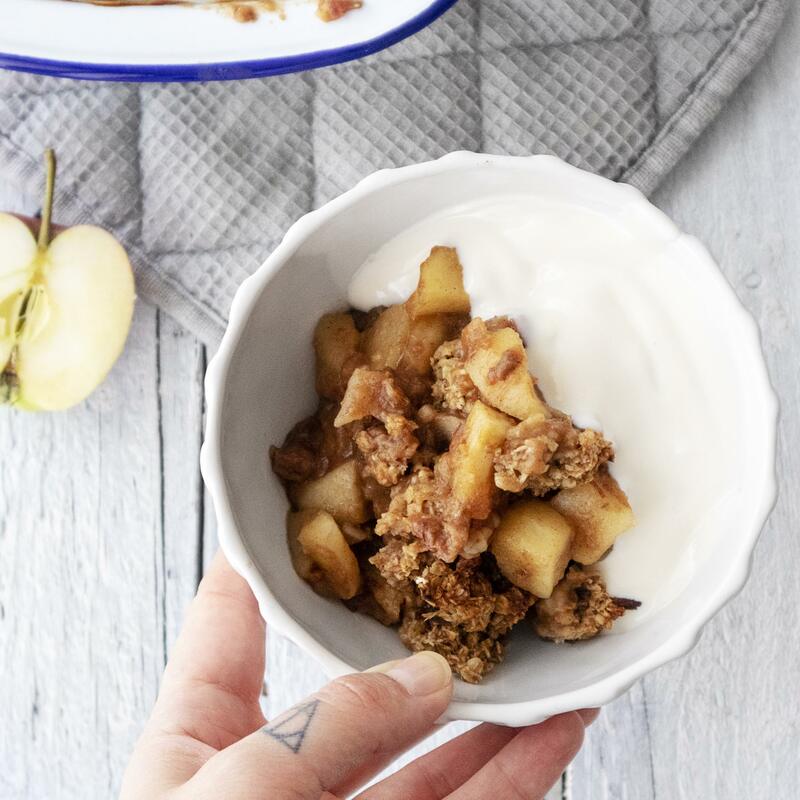 I have recently been obsessed with this super simple, yet delicious Breakfast Crumble Recipe and I’m so excited to finally share it with you! 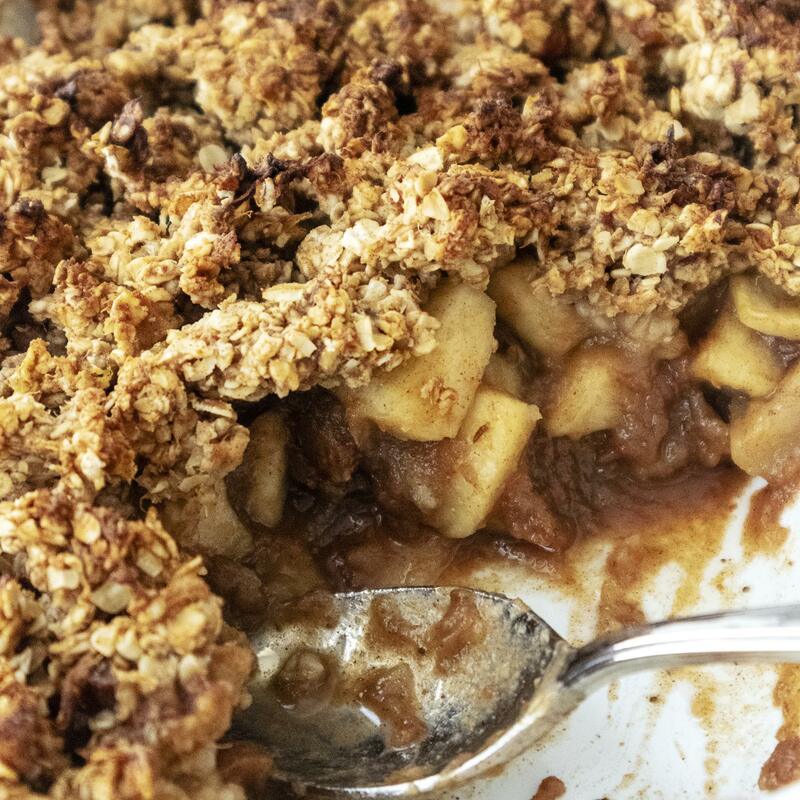 There’s hardly anything that I generally don’t like food-wise (as long as it’s vegan of course ;)), but dried fruits have always been something that I just couldn’t get my tastebuds around – especially raisins/sultanas!They’re something you can truly chase me away with – however, there’s also one exclusion: warm apple pie and apple crumble! 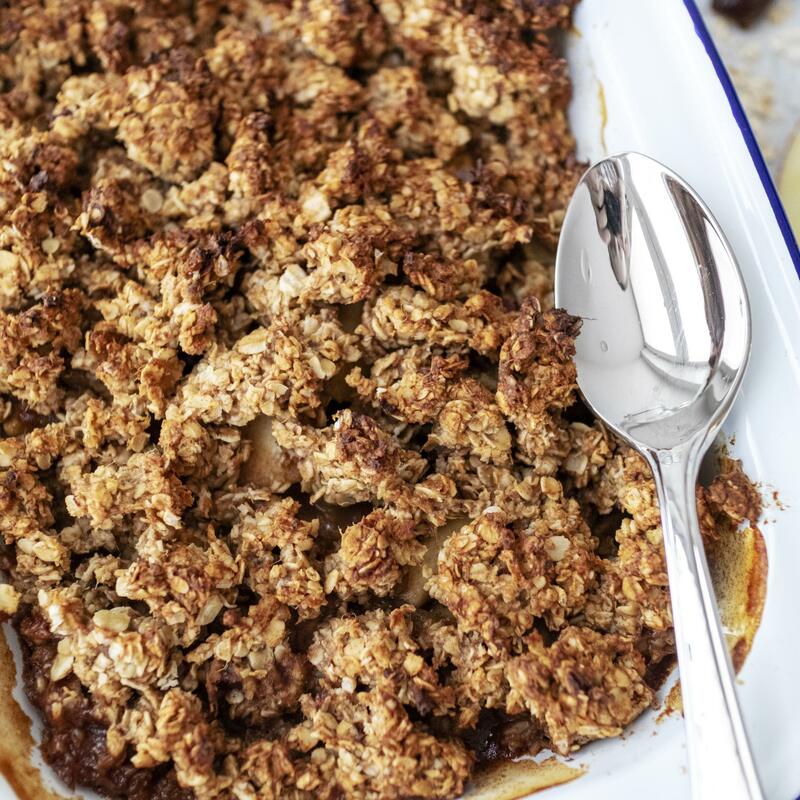 They are the true exception to the rule and the only way I really accept having them in a dish – so don’t be surprised to find them in this breakfast crumble recipe here! If you of course can’t deal with them at all, be it in a crumble or elsewhere, you’re of course more than welcome to simply leave them out. Believe me: This crumble will turn out just as tasty! So, we came home with a massive load of apples, and I have to use them somehow, right? Making a crumble almost instantly crossed my mind, though I really wanted to take a healthier twist on a traditional crumble. As you know I do occasionally enjoy food including refined sugar (especially vegan donuts!) but I also try to leave it out of my own cooking at home and my recipes nowadays very rarely call for caster sugar or similar. In this delicious recipe I am using dates to add some more sweetness to the dish & make it taste like a real treat. It’s the perfect autumn morning breakfast and it makes your kitchen smell absolutely amazing – I’m sure I don’t know anyone who wouldn’t want to get up for this! Wash, peel and core the apples, then cut them into bite size pieces. Chop all 8 medjool dates into small chunks and add them to a medium sized saucepan over medium heat. Toast them for about 1 minute whilst stirring occasionally, then pour in just enough water to cover the dates. Add the chopped apples to the pan, then pour in about 100ml water, so they don’t burn at the bottom of the pan, and gently stir. 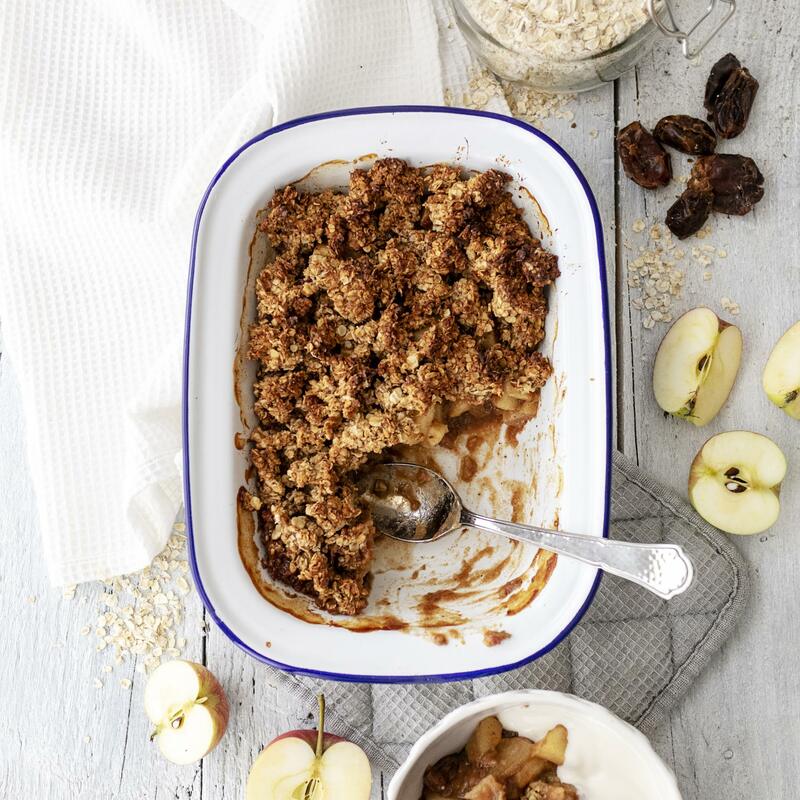 In the meantime, prepare the crumble: In a large bowl, combine the oats with the ground cinnamon, then use a spatula to stir in the coconut oil. Pour in the date mixture and mix well. 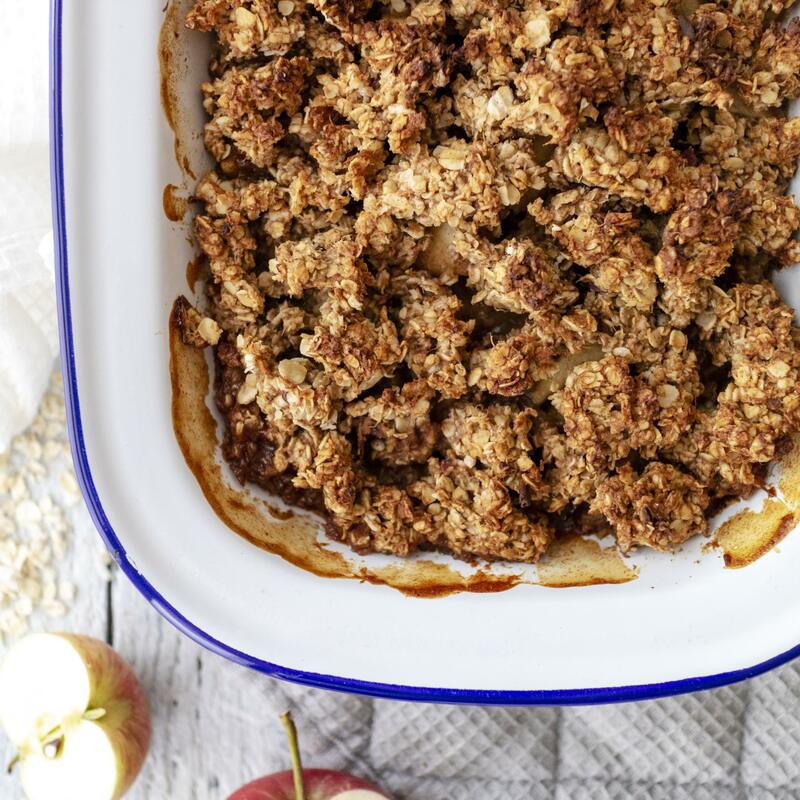 If the mix is too wet to crumble, simply add a little more oats until you get a sticky, but crumbly texture. 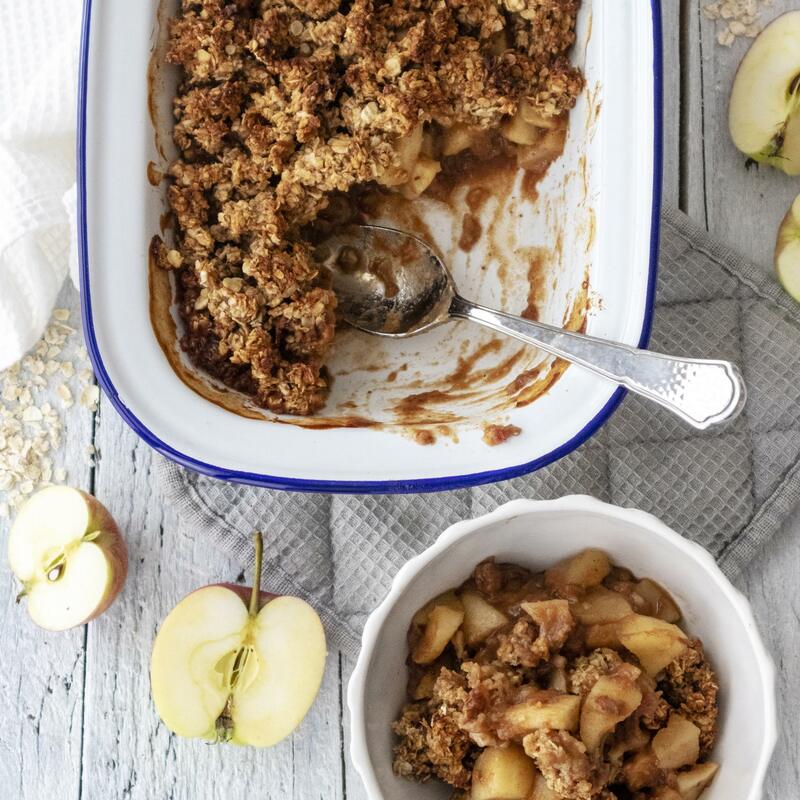 Once the apples have softened, remove the cardamom pod & cloves from the pan and pour the apple mixture into an oven proof dish. 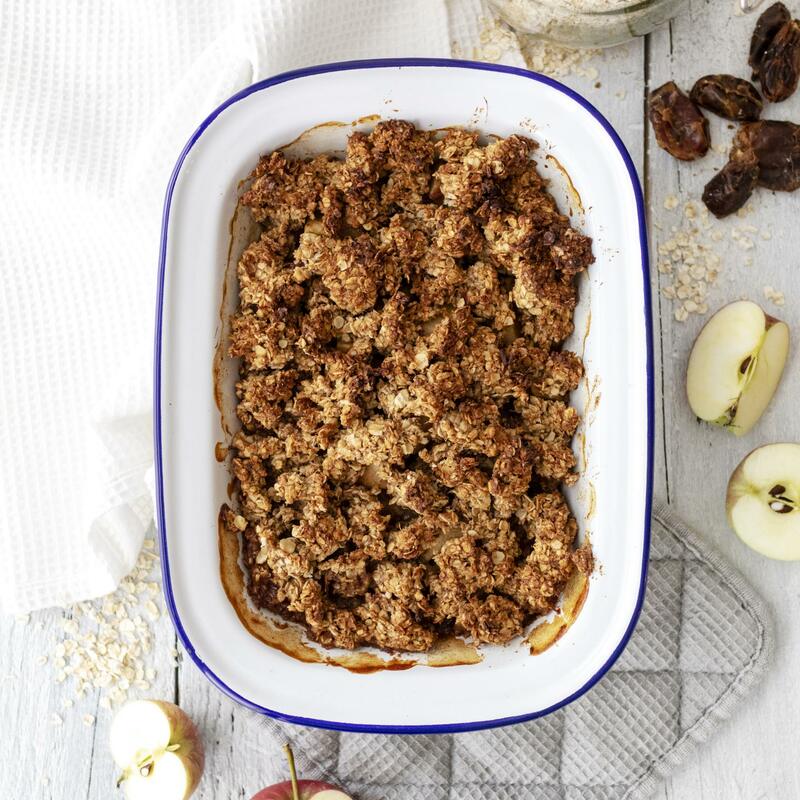 Using your hands, add the crumble onto the top and transfer the dish to the oven for about 15-20 minutes at 180C/fan 170C/gas. 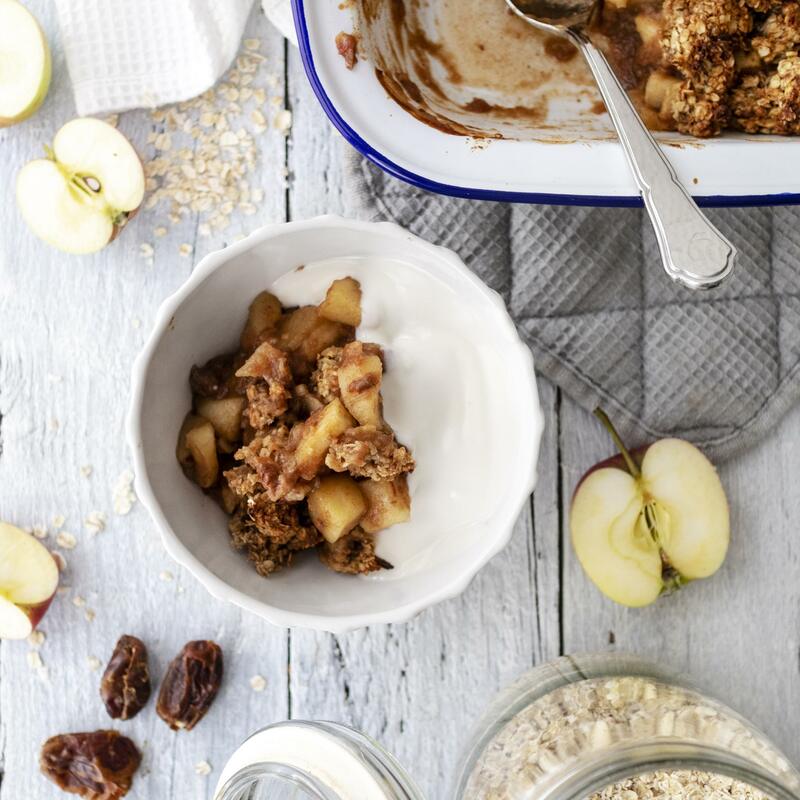 Top tip: You can easily prepare this delicious vegan breakfast crumble recipe in advance – simply remove it from the oven and let is cool down, then set in the fridge overnight and reheat in the oven the next morning. 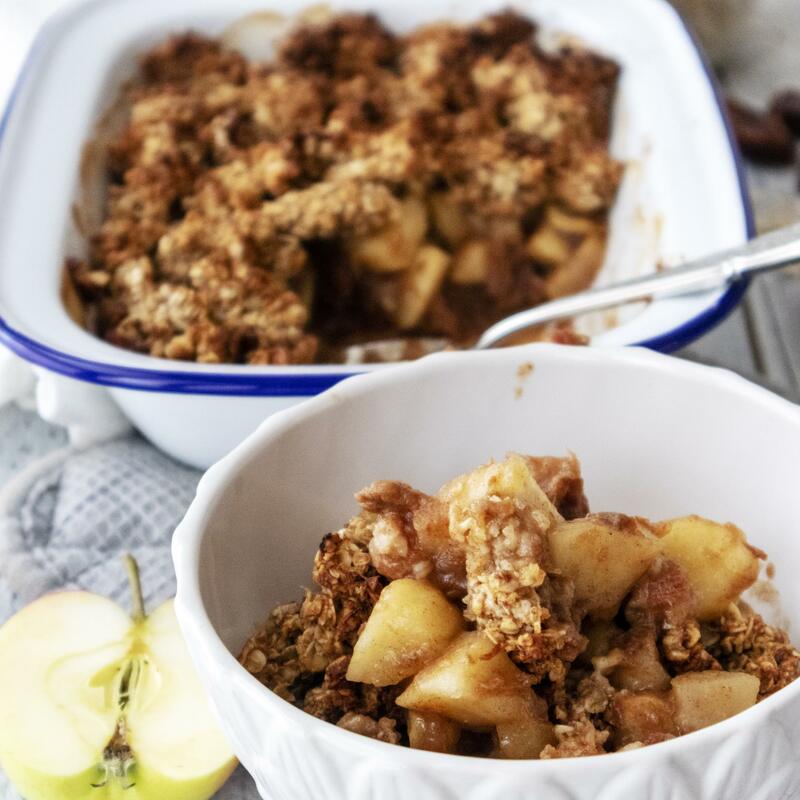 I hope you’ve enjoyed this Vegan Breakfast Crumble Recipe! On the look-out for more vegan breakfast recipes? Check out my breakfast recipe section!